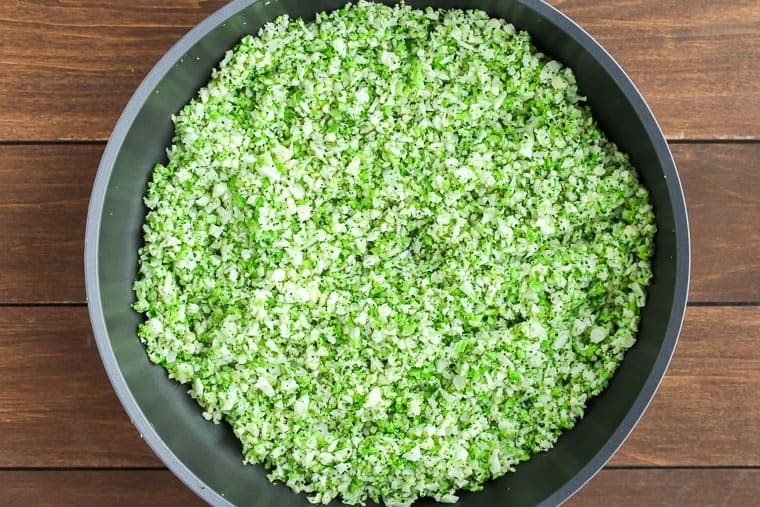 Cheesy Broccoli Cauliflower Rice is an easy keto side dish. 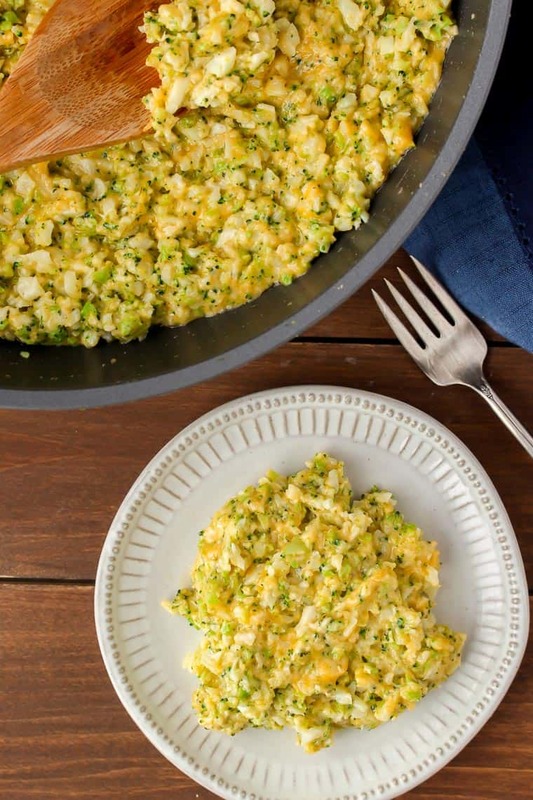 Made with riced cauliflower, broccoli, and plenty of cheddar cheese, this low carb recipe is also naturally gluten free! Back in my vegetarian days, I used to buy prepackaged broccoli cheddar rice and eat just that as a meal. It probably wasn’t the best choice, even if carbs weren’t an issue, but it was so darn good! It’s one of the many foods that I miss now that I have to follow a low carb diet. So, I decided to come up with my own low carb version. Cauliflower rice serves as the base for this recipe. To get a similar consistency to the boxed brand, I also rice the broccoli. This helps make it so that both vegetables cook more evenly. The sauce is a basic cheese sauce that can be used for a variety of recipes, but is really what gives this side dish recipe so much flavor. You can serve this rice alongside of just about any meat or seafood, or eat it just on it’s own. Try stirring in some chicken, crumbled bacon, sausage, or diced ham for more heartiness. This is an easy side dish recipe that can be served alongside most meats and seafood, or enjoyed on it’s own. It’s a low carb, gluten free recipe that is also suitable for those following a keto diet. This is a great recipe to sneak in more vegetables. With plenty of cheese, even the kids won’t complain about eating broccoli! Rice the cauliflower and broccoli, and shred the cheese. 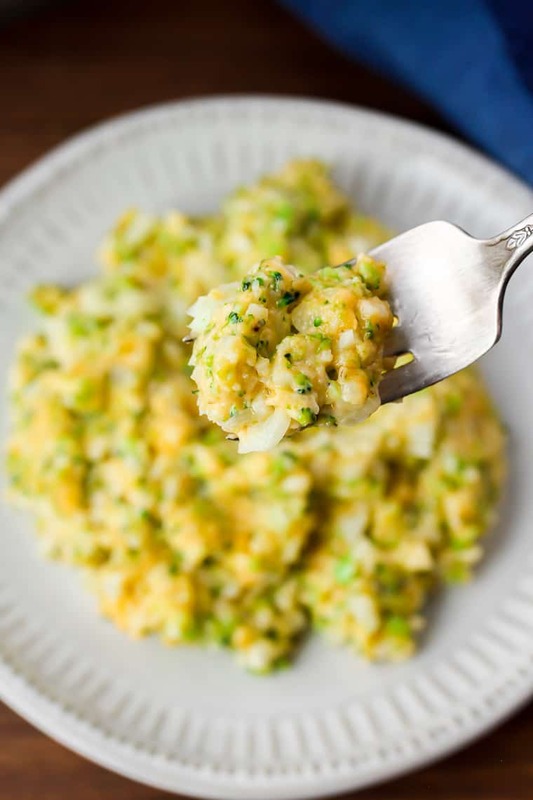 You can rice the cauliflower and broccoli in a food processor by cutting it into florets, adding it to the bowl of the food processor fitting with a blade, and pulsing a few times. You may need to work in batches. Some grocery stores carry riced cauliflower in the produce section now, as well. Use fresh cauliflower and broccoli for the best results. If you choose to use frozen, you may have to cook it longer to get all of the extra moisture out. It is strongly recommended to shred the cheese from a block rather than using pre-shredded bagged cheese. Cheese from a block melts better and doesn’t contain any added starches. Heat olive oil in a large skillet over medium high heat and add the cauliflower and broccoli rices. Season with the salt and pepper. Cook, stirring often, until just tender – about 8-9 minutes. Transfer the rice mixture to a bowl, wipe the pan clean, and return it to medium heat on the stove top. Add the butter, heavy whipping cream and mustard powder to the skillet and whisk until the butter is fully melted and the mixture is hot and bubbly. Stir back in the rice mixture and continue to cook an additional 2-3 minutes until everything is well combine and heated through. 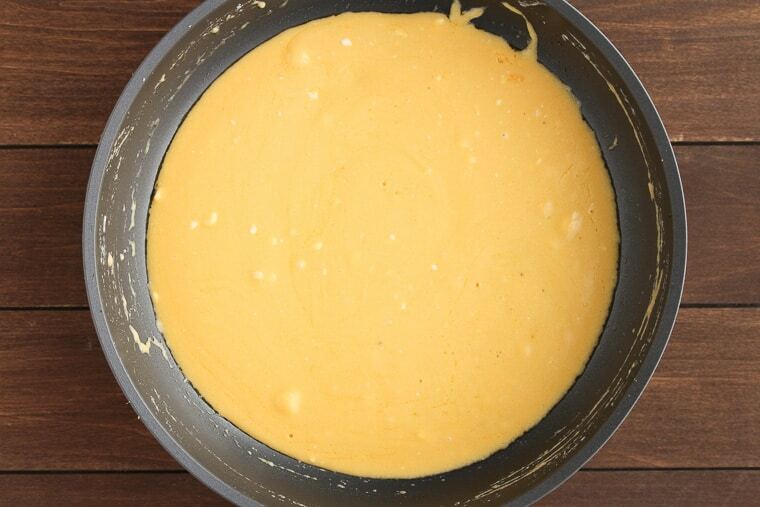 Serve straight out of the skillet or transfer to a serving dish. Garnish with extra cheese, if desired. 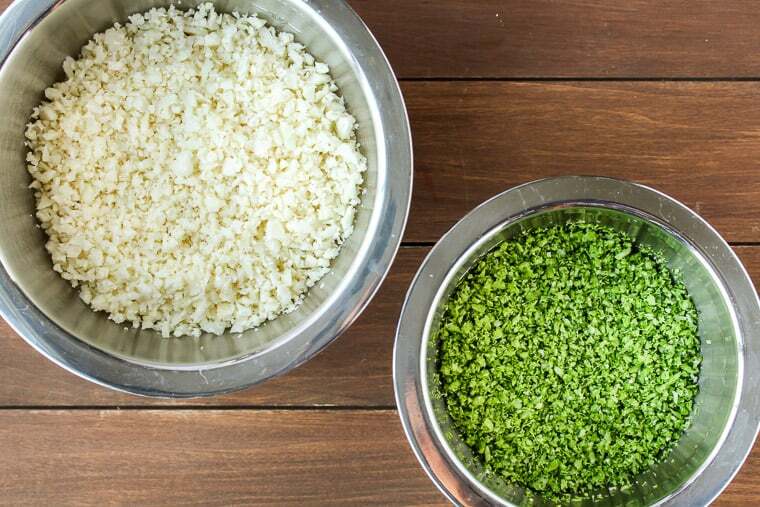 You can rice the cauliflower and broccoli in a food processor by cutting it into florets, adding it to the bowl of the food processor fitting with a blade, and pulsing a few times. You may need to work in batches. Shred the cheese from a block rather than using pre-shredded bagged cheese. Cheese from a block melts better and doesn’t contain any added starches. 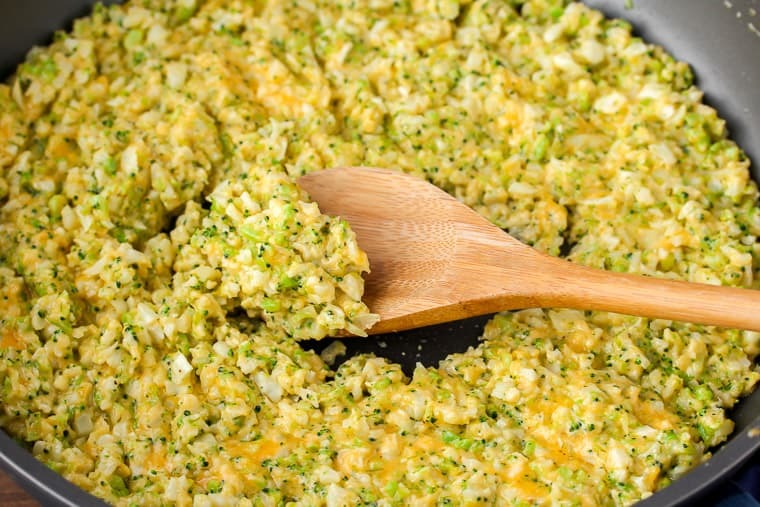 Use fresh cauliflower and broccoli rather than frozen for the best results. Add in some cooked chicken, crumbled bacon, sausage, or diced ham for added protein, flavor, and heartiness! Store any leftovers in an air-tight container in the refrigerator. Use within 3-5 days. Can you substitute the heavy cream with half and half or milk? Yes, just be aware that the cheese sauce may be on the thinner side should you choose not to use heavy cream. 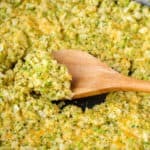 Love this Cheesy Broccoli Cauliflower Rice Recipe? Follow me on Pinterest, Instagram, and Facebook for more! Add the cauliflower and broccoli rices and season with the salt and pepper. Cook, stirring often, until just tender - about 8-9 minutes. Transfer the rice mixture to a bowl, wipe the pan clean, and return it to medium heat on the stove top. Mix in the cheddar cheese until melted, then stir back in the rice mixture. Continue to cook an additional 2-3 minutes until everything is well combine and heated through. What is the serving size of this? WOW!! Such an incredible side dish!! My family would LOVE this! thanks! I love caulirice! Looks so delicious and healthy! This is going to be a huge hit in my home! We could eat this as a meal – need to try this ASAP! Perfect recipe idea! The cheese makes it kid-friendly. My grandson is picky with veggies but he loves cheese, so this would be the way to serve him vegetables to his meal. What a yummy side dish! Love the alternative to carb heavy white rice. And it’s so simple!